We did it! Thousands of activists, members and volunteers won a victory for us all. The Old Dominion Electric Co-op (ODEC) announced last week that it has suspended plans to build the largest coal-fired power plant in Virginia. 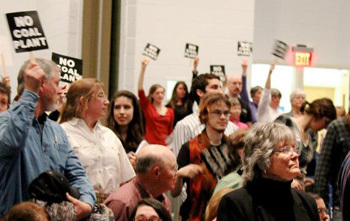 proposed by ODEC for Surry County, Va.
For more than three years, Appalachian Voices' members, volunteers and staff have led the regional grassroots fight against the plant slated for construction in eastern Virginia’s Surry County. Fueled by mountaintop removal mined Appalachian coal, the plant would have been a major contributor to air and water pollution and climate change. Capturing our forward momentum, now is the time to rally as we take on corporations who write rules for their own benefit regardless of the impact on ratepayers, taxpayers, Virginians’ health and natural heritage. Together we can continue to stop entrenched utility companies and move the Southeast away from coal toward to a clean energy future. If you ever doubted the power of your support, doubt no more. We will continue to uphold protections for clean air and clean water, ensure that coal waste is kept out of our water supply, and to work to end the senseless destruction of mountains. It is often a bumpy road but your support keeps us strong. If you have not become a member yet, please join us today. It does make a difference. Thank you. On August 24-26, come to beautiful Grandfather Mountain, N.C., to enjoy the fresh mountain air and great tunes at the fifth annual Music on the Mountaintop. Once again, Appalachian Voices was chosen as the featured non-profit, receiving a portion of the proceeds. The line up includes hosts Railroad Earth and other notable musicians including Sam Bush Dr. Dog, The Dirty Dozen Brass Band and many more. And don’t forget to stop by the AppVoices tent to learn more about our vision for a prosperous future for Appalachia! Join, give or renew today to add YOUR voice to the chorus working to protect the air, land, water and people of Appalachia. 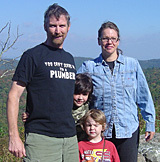 Betsy Shepard of Surry County is oh-so-many things: a wife, gardener, small business co-owner, homeschooler to her two children -- and champion in the fight against the ODEC coal plant in Virginia. The latest issue of The Appalachian Voice is now available, featuring a look at how we are navigating the demands on our water in an increasingly thirsty world. Join Appalachian Voices to receive a copy of each issue delivered to your door, or view the issue online. Aug. 23, 6:30 p.m.: Presentation, reception and booksigning with author, Jay Leutze. Catawba College, Salisbury, N.C.
August 24-26: Appalachian Voices is the featured non-profit at the 5th annual festival hosted by Railroad Earth. Sept. 3-6: Appalachian Voices is the featured non-profit at the 5th annual festival hosted by Railroad Earth. Oct 13-14: See mountaintop removal and celebrate Appalachian culture with Larry Gibson and other inspiring mountainkeepers. Kayford Mtn, W.Va.